Yay! Congratulations to Cory Doctorow, Neil Gaiman, Terry Pratchett and John Scalzi, too, for being finalists in the Young Adult category. 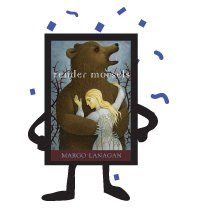 Tender Morsels is a Tiptree Honor Book! Yes, it's true! Along with another Australian, the Aurealis-Award-stealingwinning Alison Goodman's The Two Pearls of Wisdom. :) And Ursula K. Le Guin's Lavinia. And a bunch of other good books - go and have a look. Oh, Patrick Ness and Nisi Shawl (who was a coordinator at Clarion West during 'my' year, 1999) tied as winners. Margo Lanagan's "Night of the Firstlings" is an eerie retelling of the biblical curses of Egypt, and offers this collection's most supple and inventive language. Like Ted Chiang, Lanagan is astute at applying logic to fantastic situations. She renders the Jewish exodus through the parted seas in graphic detail, showing us a realistic sea floor complete with soggy chasms and scurrying clamlike creatures, bringing new clarity to the old yarn. ...in a thoroughgoing if not wildly enthusiastic review of Eclipse Two. ...1000 words this morning before breakfast. Sorry, should have tweeted this instead of blogging, shouldn't I? Sometimes readers just don't get you. And if you set up Google Alerts for your books, you get to hear about it. Rats! 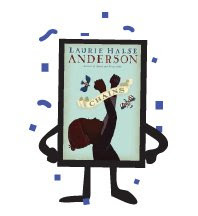 KO'd by Chains in SLJ Battle! Both books earned big points for captivating beginnings. No, no! Don't say it, Coe! there was simply no way to emotionally connect to them all. Oh nonsense, Coe, you can't have been trying. I connected with every one of them. That Ellen Datlow, she's so kind. Seeing that the Ditmar nominations are due, she's offering to send Word copies to anyone who hasn't read 'The Goosle' (or Lucy Sussex's 'Ardent Clouds' or Anna Tambour's 'Gladiolus Exposed'. She's sent out several copies already. Leave your email address in the Comments if you need a copy of any of the above. Tell me which one(s), of course. I'm afraid this offer doesn't extend to e-copies of Tender Morsels, also eligible. :) You'll have to buy those, over here, for example. ...for 'outstanding achievement in the literature of psychological suspense, horror and the dark fantastic'. See? What do you think my chances are against this lot? I haven't seen, let alone read, any of them except my own. Unfortunately the Printz and Jackson awards are on on the same weekend in July, so although I'll even be in roughly that corner of the world, I won't be at Readercon to see what happens. And Tender Morsels emerges the winner after Round 1! Meg Rosoff, the judge, 'was shocked, transfixed, amazed'. She thought TM was 'utterly astonishing – beautifully written, brave, uncompromising, highly uncomfortable – but astonishing' and that her 'fifteen year old self would have killed for a book like this'. The first round judges are a stunning array: Roger Sutton, Jon Scieszka, Elizabeth Partridge, Meg Rosoff, Rachel Cohn, Ellen Wittlinger, Tamora Pierce and Ann Brashares. Tender Morsels is up against Philip Reeve's Here Lies Arthur, in the fourth match, which happens this week. It would be nice not to go out in the first round. Fingers crossed. My most successful ever short story 'Singing My Sister Down' is up for a Seiun Award(Best Foreign Language Short Story), which is voted on by people who go to the Japan Science Fiction Convention in July. The collection it's from, Black Juice, was translated by Chiori Sada and published by Kawade Shobo Shinsha, in May 2008. What have I been up to this April? Well, there was work - short weeks' worth of it. I had a couple of days bureaucratting at the end of last week and then a weekend in Melbourne that took in Monday as well, and now Easter is here. This seems like a good amount of dayjobbing to me. 'Nother short week next week. Purr. Melbourne was cold - one could have worn a coat and not looked stupid. It felt like walking around a foreign city, after sweaty Sydney. The air is quite different down there. It was all family and fun, no writerly talks or panels to get nervous about. I have seen the TWO UK covers for Tender Morsels. Not sure if I can show them to you yet - I'll ask. No, I don't think I did say here that it's coming out from 2 divisions of Random House: David Fickling Books and Jonathan Cape, for younger and older readers respectively. The DFB one is kind of besmirched-girl-with-a-pearl-earring, only without the earring - there was an earring for a minute there, but we got rid of it. Jeremy Caniglia, who did the Red Spikes cover, has worked his magic again. The Cape one has a faintly A. A. Milne look about it at a distance, but get up close and you see that the bear has teeth and claws, and the girls have a touch of Goth about them, and the blue background is not innocent sky but quite violent brushwork with some crows being thrown about in it. Very different interpretations - both from each other and from the Aus and US versions. I've been lying awake this morning trying to think up a Gothic story set in Australia, but not rural Australia. It's Good-Friday quiet outside car-traffic-wise, but we're getting a lot of planes going over. Four days of freedom, and nothing planned - yay!